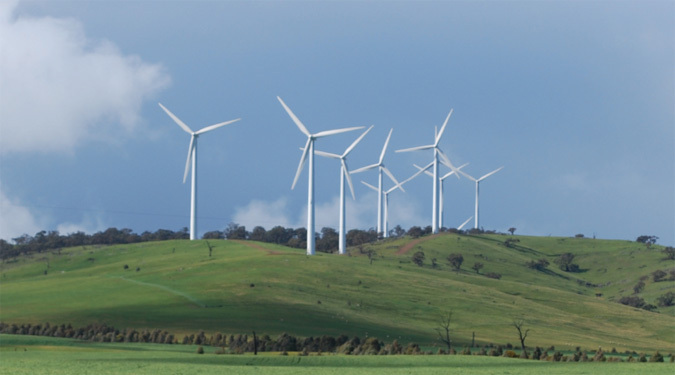 Renewable Power Australia – Can Wind Power Make 20% By 2020? Challicum Hills Wind Power Plant near Ararat in Victoria Australia. Australia has the aspiration to be able to provide 20% of all its electrical power from renewable sources, and to achieve this by 2020. Can something like this actually be achieved? While it may be a possibility, the most probable result is that it will not be achieved. This is something that can actually be calculated quite easily. Now, while the term Renewable Power covers a variety of sources, including Hydroelectric Power, the most commonly used sources of choice these days are the two sources, Wind Power and the versions of Solar Power. For the purposes of this Post, I am concentrating on Wind Power, and while there are these two sources, the most commonly proposed one is Wind Power, and in fact when it comes to these two sources, Wind Power is constructed on a 10 to 1 basis with respect to actual Power ratings. That is mainly due to the cost of the two sources, as any version of Solar Power is considerably more expensive than for Wind Power. First, I want you to look at this deceptively simple looking graph, one not often referred to. This indicates actual power consumption. This graph is typical of almost everywhere in the developed Western World where electrical power is available on a constant and reliable basis. 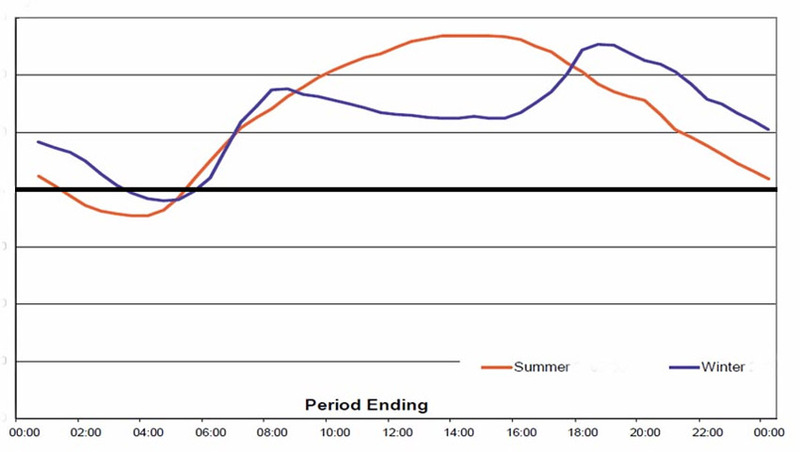 Summer consumption is indicated by the orange line and Winter consumption by the blue line. The dark line across the graph indicates that all electrical power being consumed below the line is required absolutely on a 24/7/365 basis, and in fact that amounts to more than 60% of all power being generated. Across the bottom of the graph, the X axis, indicates the hours in the day, starting at midnight, and moving across the page and back to midnight. The only difference between graphs from different areas is the actual totals for the power being consumed, and that is indicated by the vertical axis. For the purposes of actually working out accurate results, what needs to be done with that chart above is to put values for power on it. For that purpose, we have access to current data, as shown on the two further graphs shown here. These graphs are for an area covering all of Australia excepting the States of Western Australia and the Northern Territory. The top graph shows the Summer consumption for this area, and the lower graph shows the Winter consumption. Note the similarity with the generic chart above. With these two images, if you click on them individually, they will open in a new and larger window, and you can then refer back here for the text. This same area also contains the vast bulk of Wind Power Plants as well, so, using this area as a guide we can calculate up what it is required to get Wind Power up to that aspirational level of 20% of all power being consumed. I have said on so many occasions that it is not the Nameplate Capacity of these Plants (the up front total) that should be used, but the actual power that is being generated for consumption, and the two figures are vastly different. This is because the wind itself is variable, so the individual towers themselves are not spinning (and generating their full power) on a 24 hour basis. Now, while power is being delivered for almost all of the 24 hour period, this is never the full amount of power. Averaged out over the day, and consequently the whole year that amount of power actually delivered is only a percentage of that full power. This is referred to as the Capacity Factor, (CF) and for Wind Plants, that CF varies. In most places where wind power supplies power to the grids, that CF averages at around 20 to 25%. The more recently constructed plants are more efficient, naturally, and their CF can average around 30 to 32%, and some even can be as high as 40%, depending upon their location. This link shows the actual performance of those Wind Plants in that area. This data is for Saturday February 4th 2012, the day immediately prior to this Post. The upper graph shows the individual performance of all indicated Wind Plants, and there are 24 of them listed here. The second graph shows the total power being generated by all 24 of those Wind Plants on an hour by hour basis, indicated by the black line. As you can see under the graphs, all 24 of those Wind Plants are listed, and this is the information I will be using with respect to calculating up the numbers to reach the aspirational level of 20% power from Wind sources. All of these Wind Plants have been constructed in the last 6 years or so. I have gone to each of the sites for those 24 Wind Plants. In earlier Posts I have detailed how any site for a Wind Plant, whether existing already or at the proposal stage use deceptive figures to explain the power that is actually being generated. Here they use the information that this Plant will supply X number of homes. Why this is deceptive is that the Plant is not connected to those homes but the overall grid, and supplies its power to the grid alone. And, if the Plant only has a relatively low CF of around 30%, it cannot supply the power to those homes on the 24/7/365 basis that an average residence consumes electrical power. They also use data that indicates the Wind Plant will be saving X number of tons of CO2 emissions, also misleading. However, the reason I went to all the sites of those 24 Wind Plants is to find an indication as to the total cost of the Plant itself. As these Plants are in the main recently constructed, that monetary figure can be used for the purposes of calculating to some degree of certainty the overall cost if that power level was to be brought up to that aspirational level of 20%. When the total cost of all those named 24 Plants is added up, it comes to $5.2 Billion. According to the data from the Government’s own yearly paper into Australia Energy, at this link, (huge pdf document of 105 pages and around 2.3MB) Wind Power currently provides just on 2% of all the electrical power being generated for consumption in Australia. So now, extrapolating that up to the aspiration of 20% power from Wind sources, it’s an easy calculation to work out that total cost. That comes in at ten times the existing total. That comes in at $52 Billion. Now while that is in the dollar value of those pasts 6 or 7 years, the dollar value would blow out, but for the purposes of the exercise, I’ll just stay with that figure of $52 Billion. Now, as the aspiration is for this level to be reached by 2020, that means that $52 Billion is spread over those next 8 years. So now, that means that an amount of $6.5 Billion needs to be set aside each year for those next 8 years. There is no way on this Earth that $6.5 Billion will be spent just to construct the Wind Plants required in that time. Even if the Government could persuade entrepreneurs to sink that amount of money, EACH YEAR into the construction of those Wind Plants, then that decision needs to be made right now, not year by year, but right now. Any proposal for any form of electrical power generating plant, be that coal fired, natural gas, wind, solar or any type of plant, it needs time to get to the stage where it is actually delivering the power for consumption. That’s if everything lines up smoothly the first time around, and that will be in the case of every Plant required in that time span. That time is in the vicinity of 5 to 10 years from the original thought bubble, through the formative stages, research and exploration to see if the area has winds conducive to wind power plants, then on into the proposal stage, then all the stages of administration, organising the financing, the impact studies on so many fronts, the construction, and everything else associated with getting that Plant to the power delivery stage. So, with 2020 now only 8 years away, then those plants are needed to be being considered right now, if a staged level of spending and construction is to be taken into account. So then, let’s assume that the $52 Billion is no problem. Keep in mind that to make any of these renewable power plants attractive for any Private ventures to move into, then the Government has to ‘sweeten the pot’ so to speak. What is currently happening is that Governments at both the Federal, and the State levels are having to subsidise that funding by giving subsidies to these proposal, and that is currently amounting to around half of the costing for the Plant, so when I say $52 Billion here, possibly half of that is coming from the Commonwealth and State Governments. If that money is no perceived problem, then let’s actually look at what needs to be done. Now, go back to those existing 24 Plants listed that cost that all up total of $5.2 Billion. That’s 24 Plants in all. In total, that amounts to 965 of those huge wind towers, each with a large nacelle on top that holds the generator and associated hardware. Because that makes up only 2% of what is currently being produced, then we need to be constructing 10 times as much as what is currently existing. So now we need an extra 240 of these plants, or, an extra 9,650 of those huge towers. With 240 of those plants required to get the total up to 20%, and to do that in the next 8 years, then that means we would need to construct 30 of these new plants each year and a total of 1,200 towers each year for the next 8 years. 30 new Plants a year. That’s almost 3 new Plants opening up each month for the next 8 years, or on average one new plant opening up every 12 days. Now perhaps you can see that the money is the least of the problems. The existing total number of Plants have to be added every 10 months for the next 8 years. No, and even the most ardent Wind Power supporter would have to concede that. Those Wind Plants only have an effective life of 25 years. I have been criticised for saying this, because it’s something people cannot, or will not believe, but at every one of those existing 24 Plants, (every one of them) they indicate that the life of the plant is only 25 years. So, even though they have to construct that huge number of plants between now and 2020, they will virtually have to keep going at that same rate every year, because older Plants will be coming to their use by dates. Now, remember I mentioned above the subsidies being paid by Government’s towards the construction of these Plants. That’s not the end of it. Because those Plants have to recover all their costs, that’s all costs, including maintenance, upkeep, wages, profits etc, then all of that has to be recovered during the life of the Plant. To achieve this, they have to sell the power they generate to the grids around the Country. Because the cost is so expensive, then that wholesale price of electricity is also expensive. To make it attractive for the grids to purchase, Governments are also subsidising that cost of electricity, in other words paying the owners of the Wind Plant a cost per unit of electricity generated so that the cost of the electricity that the grid has to purchase is lessened somewhat. Even so, the wholesale cost of the electricity they produce is still (considerably) more expensive than current traditional methods of generating electricity. Again, there could be the thought that perhaps I am just making that up. Look at the following chart. 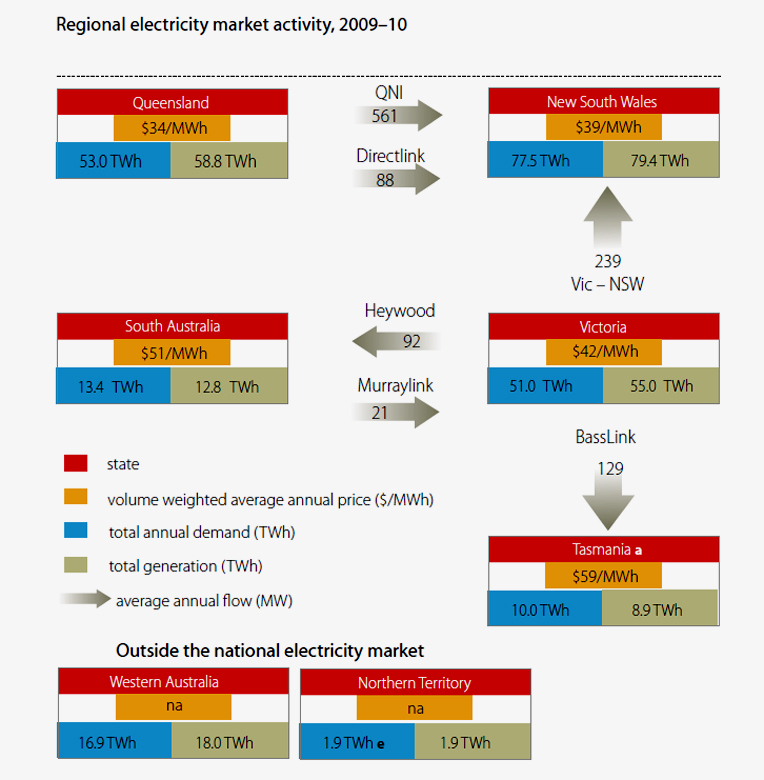 The cost per unit for the power at the grid is indicated for each of the Australian States shown in the orange highlighted figure under each State. The State with the highest amount of power currently being supplied from Wind Power is South Australia. The unit cost for electricity in that State is much more than for the other mainland States. This chart is from the Australian federal Government’s 2011 Energy Report that I linked to above, so that data is also the most currently available. Once all of the above is taken into account, that is why I can say with confidence that Renewable Power will never reach the stage where it achieves that 20%. While the aspiration was for this Renewable Power level to come solely from Wind Power and Solar Power, it has now become obvious to those people who have made those promises that something of this nature can not be done, so, what they have done now is to include Hydro electricity in the mix, so that means that all of a sudden, they can now add on all that existing hydro power, adding almost 4% to the Renewable total. Now I am absolutely certain that there will be people out there, supporters of Wind Power, who will be saying that this whole Post is full of incorrect data. Hey, I’ve used the Government’s own figures, and the actual costs, and the actual numbers for existing Plants, the actual totals for power being produced for consumption and the most current data available. All I am doing is working out what it will take to reach those levels, and the maths itself is easy, provided you have all that data available. While in the case of this Post I have used only data and costings for Wind Power, be very aware that if you cut back on the number of Wind Plants, replacing them with any version of Solar power, then the power data for Solar Power is less, hence more Solar power is required, and those Solar Plants are (considerably) more costly than for equivalent Wind Plant power levels. So, to reach 20% by 2020 then that’s an extra 1,200 towers (or towers of equivalent power) every year for the next 8 years. That’s an extra 30 Wind Power Plants every year for the next 8 years. That’s an extra $52 Billion. All this needs to be started right now if it is to be achieved by 2020. Governments can say whatever they like. On that second chart there, note the black line. This indicates the total output of all 965 towers at those 24 Wind Plants. Note how variable the power is for this day, and on most days it is similar in variability, and although the totals may be higher on some days, that variability across the full 24 hour spectrum is similar. See where that black line dips to its lowest point, from 6PM until 8PM. That total amount of power being generated is the output from ALL 24 of those Wind Plants, and that’s all 965 Towers. See how it bumps along at around 150 to 200MW for those 2 hours. That same amount of power is being generated by one large scale coal fired power plant, the Bayswater plant in 7 minutes. Now perhaps you get an idea of how, even with a huge number of Wind Plants, you will still need conventional power to provide power for when the wind is not blowing. Read that again. The total output from every Wind Plant for those 2 hours was delivered by ONE coal fired plant in 7 minutes.